Saturday March 26, New York City. Reception 1 p.m. Program 2 p.m. 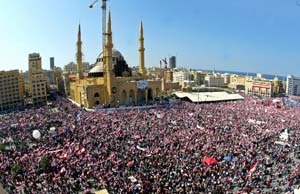 Hundreds of thousands of people rallied at Beiruts Martyrs Square March 14, in the largest protest rally so far, demanding that the government of Syria pull its forces out of Lebanon. Under relentless pressure from mass popular protests in Lebanon, imperialist demands from Washington and Paris, and calls for a pullout by the Egyptian and Saudi regimes, the Syrian government has withdrawn about a third of its troops from Lebanese territory. Many of its remaining forces, which earlier numbered 14,000 soldiers, have been redeployed to the Bekaa Valley in eastern Lebanon, near the border with Syria. Military intelligence agents of the regime in Damascus have begun vacating offices in Beirut and other cities. In the largest action so far, according to news reports, as many as 800,000 people joined a rally at Beiruts Martyrs Square March 14. The action was organized by opposition parties pressing for Syrian withdrawal. Its size reflected the popular anger at Syrias decades-long intervention in Lebanon, which has included blocking a revolutionary upsurge among Lebanese toilers from toppling the government in the 1970s that largely disenfranchised the Muslim majority. Like other capitalist parties, Hezbollah has staged rallies in a show of strength to secure a bigger share of political power in the vacuum that will be left by the forced departure of Syrian troops. The organization, which has called for an Islamic Republic and has been allied with Damascus, faces the reality of the diminished Syrian presencea problem it confronts for the first time. On March 13 Hezbollah, which is based among Shiite Muslims, held its second mass rally. Press reports indicate that at least 100,000 joined the demonstration in the southern Lebanese town of Nabatiyeh. Five days earlier Hezbollah had held a rally of hundreds of thousands in Beirut. Both the parties demanding Syrian pullout and pro-Damascus forces, including Hezbollah, have mounted weekly protests. These rival bourgeois alliances are jockeying for position in whatever government comes out of the crisis that has shaken Lebanon since the February 14 assassination of former prime minister Rafik Hariri. The same day Syrian troops began to cross the border back to their country, United Nations Middle East envoy Terje Roed-Larsen announced that Syrian president Bashar Assad had agreed to a timetable for removing his forces from Lebanona central demand of the imperialist powers. Last September Washington and Paris co-sponsored UN Resolution 1559, which called for the pullout of all foreign troops and the disbanding of domestic militias. The last demand was aimed primarily at Hezbollah, whose armed forces gained widespread popularity in Lebanon for their role in forcing Tel Aviv to pull its troops out of the country in 2000. Hezbollah reportedly has a militia of 20,000 men today. Thousands of Syrian troops left Lebanon March 12, in the first phase of a withdrawal. The first stage will see the relocation of all military forces and intelligence apparatus to the Bekaa valley by the end of March, said Roed-Larsen, according to the BBC. The schedule for the next troop movement will be determined at an April 7 meeting of Lebanese and Syrian officials. Roed-Larsen added, The second stage will lead to a complete and full withdrawal of all Syrian military personnel, assets and intelligence apparatus. Damascus has maintained about 5,000 intelligence agents in Lebanon, according to press reports, as one way of influencing Lebanese politics. Faced with the withdrawal of the Syrian forces that have served as its benefactor, and the popular protests pressing for Lebanese sovereignty against Damascus, Hezbollah has taken steps to try to shore up its support. Although still trumpeting itself as the center of resistance to Israeli aggression, Hezbollah has had to compete with other bourgeois parties for popular support and votes. It has 12 seats in the 126-member parliament. The imperialist powers are pressing their offensive against Hezbollah as part of their effort to gain greater influence in Lebanon. For the moment they are putting aside the demand to shut down Hezbollahs militia and instead are trying to force the group to help in the consolidation of a stable capitalist regime, whether in or out of government. On March 9 the Lebanese parliament voted to reinstate Omar Kamari as prime minister, nine days after he had resigned in the face of mass protests. Opposition partieswhich include rightist organizations and Walid Jumblatts social-democratic party, based largely among Druzehave so far rejected Karamis call on them to join a government of national unity. Instead they pulled out all the stops for the March 14 demonstration to strengthen their bargaining position and build momentum for national elections scheduled for May. These parties hold about 50 seats in parliament. Lebanese president Emile Lahoud tried to undermine the protest, saying on March 12, If they want to continue demonstrating, a little firecracker will lead to a catastrophe. His effort to ban a mass demonstration on February 28 was equally ineffective. Karami resigned after that outpouring.